Offered to the clients at the best rates possible, the offered range of Elisa Plate Washer has a high demand in the market. 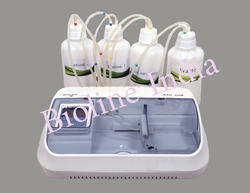 Used for the purpose of sterilizing microtiter plates, the performance it provides is highly commendable. The range made available by us offers unsurpassable functionality to the customers. Soak time: Up to 990 seconds adjustable. Sake time: Up to 990 second adjustable. Looking for Elisa Plate Washer ?